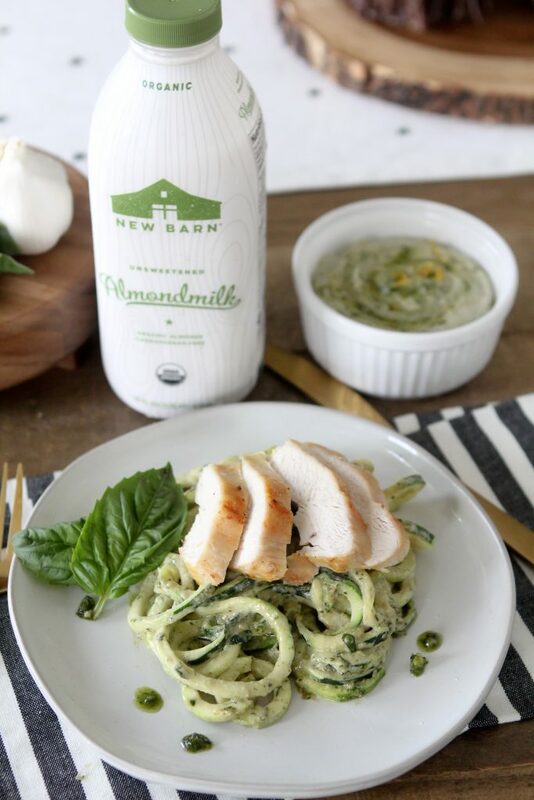 This Creamy Pesto Zoodles + Chicken recipe from The Whole Smiths is brought to you in partnership with New Barn Almondmilk. 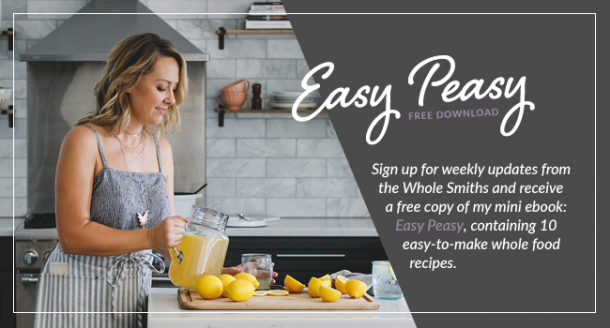 Not only is this recipe gluten-free and packed with nutrients, it’s Whole30 compliant! I just finished watching some episodes of Master of None where Aziz Ansari’s character spends some time learning how to make pasta in Italy and found myself longing to make and eat all the pasta in Italy. But you know what? I can’t even eat the freaking stuff anymore (gluten) and I was never a huge pasta fan in the first place. Is that a tribute to Aziz’s acting chops? He convinced a non-gluten eating person that I needed to figure out how to get into pasta?? That I needed some pasta NOW. In Italy?? Sigh. Who knows. But I really wanted something creamy and pasta-y after watching those. So I grabbed a zucchini and went to town spiralizing it. When I’m making a zoodle dish I have to confess, I’m not a fan of marinara/veggie based sauces paired up with the zucchini. It doesn’t feel quite as hearty to me and often it seems like the veggie on veggie action can get a little soggy and mushy. Fortunately, we don’t need no stinking marinara these days because it’s super easy to make a dairy-free, Whole30, vegan cream sauce. 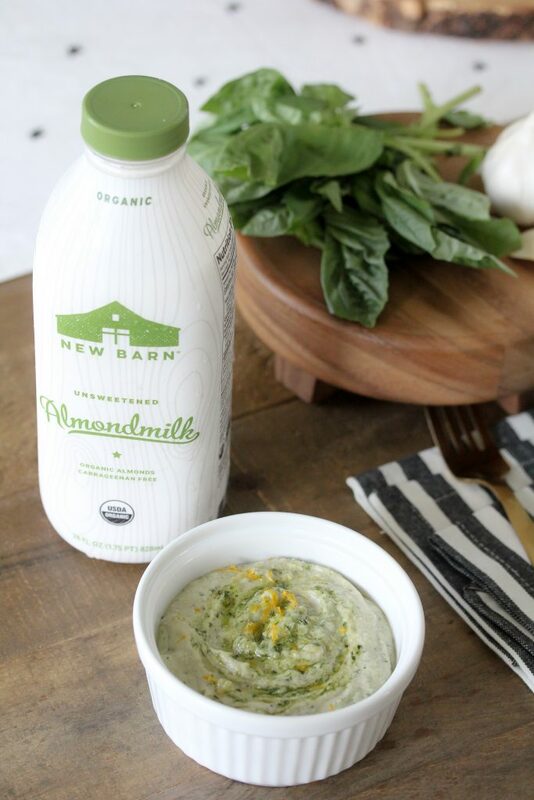 With the help of New Barn Unsweetened Almondmilk and some soaked cashews, a creamy and hearty sauce is a reality. In short, you soak the cashews for a bit of time in hot water. I’ve seen some sources recommend soaring the cashews overnight but I’ve been able to make a creamy sauce by soaking them for as little as 30 minutes. When it comes time to blend, you’re going to need to thin the sauce out a little bit and I like using New Barn Almondmilk to do so. Some recipes use water to thin it out, but for me, it leaves the sauce a bit drab. So let’s talk almond milk for a second. I use almond milk all of the time in place of regular dairy milk whether it’s in baking, smoothies, sauces, dressings etc. But not all almond milks are created equally and my personal favorite is always New Barn. First off, so many others are loaded with a variety of artificial thickeners and emulsifiers used to mimic the consistency of “regular” milk but all of those additives negate the healthy switch to almond milk in the first place. New Barn’s variety of milks don’t have any of those. In fact, their Unsweetened variety is so clean that it’s Whole30 compliant. I also like the flavor of New Barn products as they don’t have a chalky taste like so many other almond milks. In fact, New Barn uses significantly more almonds per bottle than others, 55 to be exact. 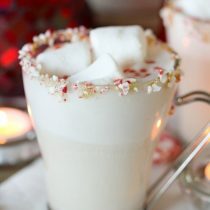 The result is flavorful milk that mimics that of homemade almond milk. Because of that, it made a perfect addition to my creamy sauce base. It’s companies like New Barn that give me so much optimism for the future of our food system. Real, honest to goodness actual food. They also have a line of AlmondCreme, almond based ice creams, made with those same guiding principles. 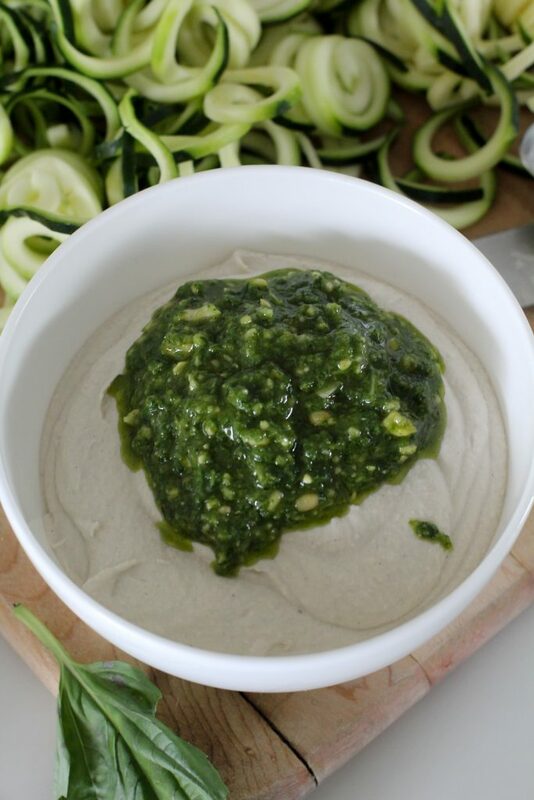 Once we make the creamy cashew base for the pasta, I add some of my Paleo Pesto to inject the pesto into it. 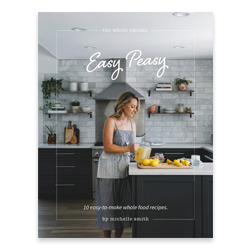 This version is Whole30 compliant as well and I’m going to suggest you need this in your life whether you make this recipe or not. 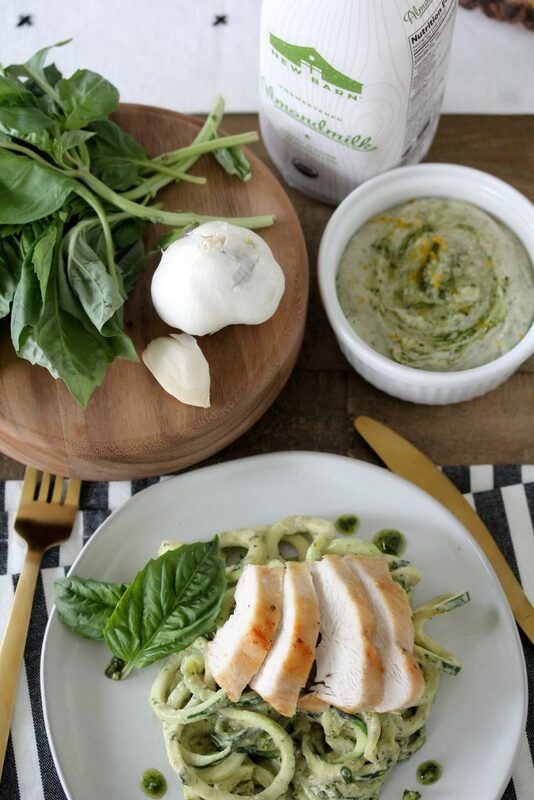 My Paleo Pesto pairs well with your proteins, sweet potatoes and any veggie you may be roasting up. All right now. On to these zoodles. In case you haven’t already figured it out zoodles = zucchini noodles. Or any other veggie you can spiralize for that matter. Autocorrect hates the word and I’m constantly having to change “noodle” back to “zoodle” but that small inconvenience is well worth the technological struggle to healthy faux pasta. But here’s the deal with zoodles, they can get really soggy if you don’t cook them properly, particularly zucchini. The I first started cooking zoodles I thought I needed to cook them down prior to adding the sauce. I steamed them, I sautéed them, and even boiled them and each time I ended up with a soggy lump. I didn’t understand what all of the fuss was about. Until I realized that you could just add them into your pasta sauce and heat them through from there. This prevented the vegetable from releasing all of its moisture. This technique works great with any squash based zoodle. As far as sweet potatoes, I still cook them a bit prior but not as long as you may think is necessary. Another factor to keep in mind is the size of your zoodle and what blade you are using. For squash based noodles I like using the larger blades on my spiralizer (I love my Paderno brand). The larger cut helps them to keep it’s share and texture more than the smaller cuts. So now we have the sauce, we have the zoodle and we just need the chicken breasts. You can cook these any way that you’d like to be honest. Grilled chicken would be amazing atop of these noodles, however it’s winter right now and I had no interest in firing up the grill so I pan sautéed them to an internal temp of 165*. Slice it up and place on top. Easy peasy. 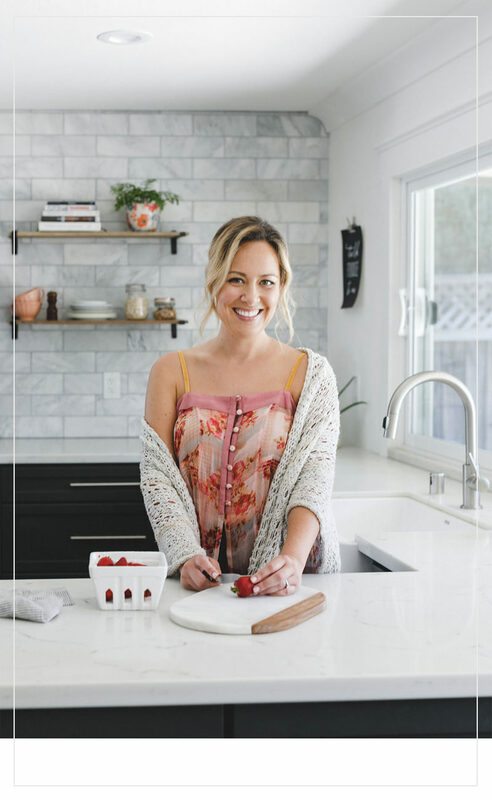 I hope you’ll love this recipe as much as my family and I do and it makes your Whole30 even tastier. But really, this is a dish you should be making regardless of whether or not you are on a Whole30. And don’t forget to pick up some New Barn Almondmilk on your next grocery run. You can use their handy store finder here to find your nearest retailer HERE. 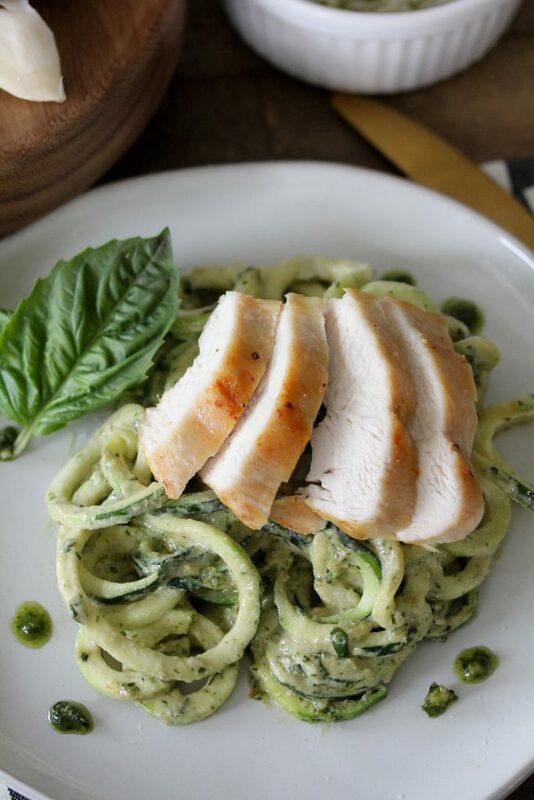 This Creamy Pesto Zoodles + Chicken recipe from The Whole Smiths is brought to you in partnership with New Barn Almondmilk. Not only is this recipe gluten-free and packed with nutrients, but it's Whole30 compliant! Add the cashews, almond milk, water, lemon zest, garlic, one teaspoon of the salt and the optional red pepper flakes to a blender and blend on high until the sauce is creamy. Add the Paleo Pesto and pulse to combine. Additional salt to taste and set aside. Generously season the chicken breasts with the remaining 2 teaspoons of salt and black pepper. Meanwhile heat a large frying pan over medium-high heat and add your ghee or oil to the pan. Once the oil is hot add the chicken breasts to the pan and cook for 3-4 minutes on each side until you have a lightly browned and seared chicken breast. 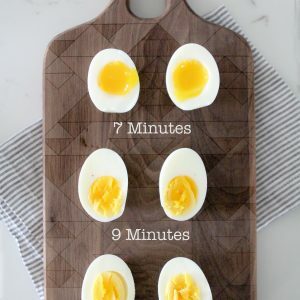 Reduce the heat to medium and continue to cook the chicken breast flipping every 3 minutes until it is cooked though and has an internal temperature of 165* F. Once cooked, set aside covered to rest for 10 minutes. 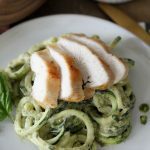 Spiralize your zucchini and add them to the same pan that you cooked your chicken breasts in and heat over medium heat. Add the creamy pesto cashew cream sauce and toss to coat. Cook until the noodles are heated through and lightly tender. Salt to taste. 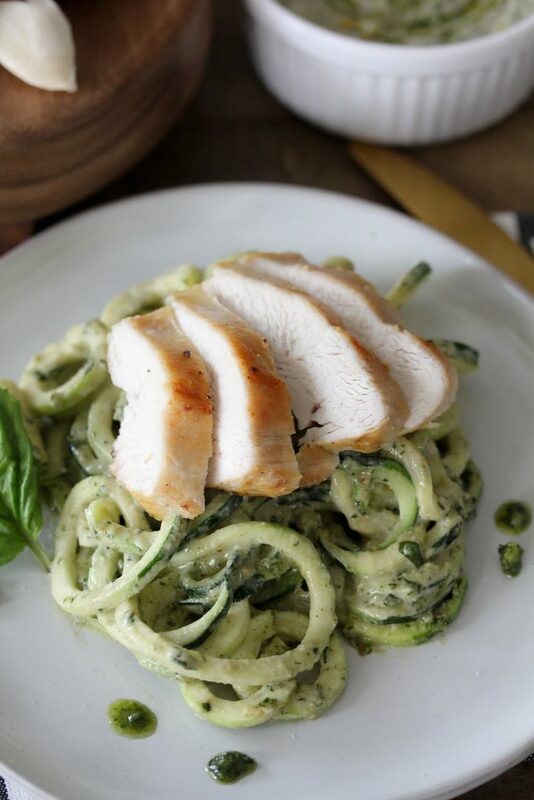 Slice your chicken breasts against the grain and serve over top of the creamy zoodles. 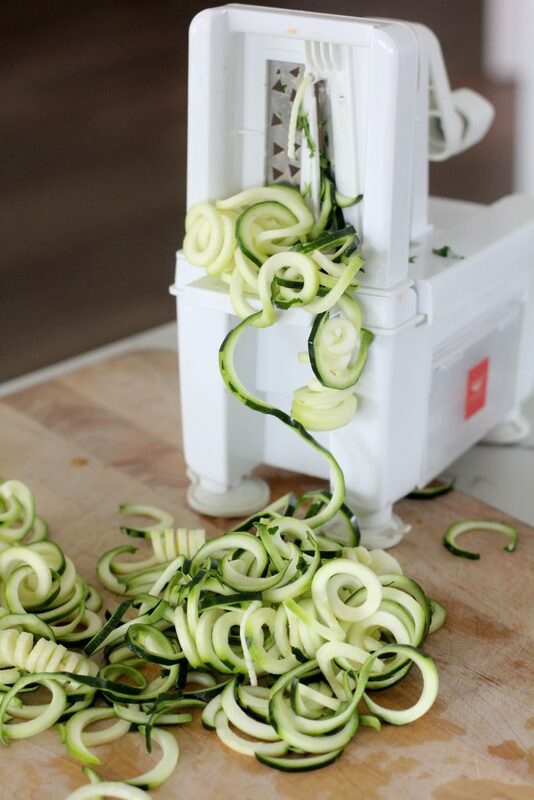 Hi I was wondering what brand of the spiralizer you used to spiralize your zucchini? 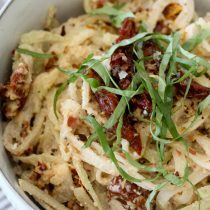 I use a Paderno Spiralizer.